In this article, we will develop an Android application that can search Google Places API using SearchView widget and show the results in Google Maps Android API V2. 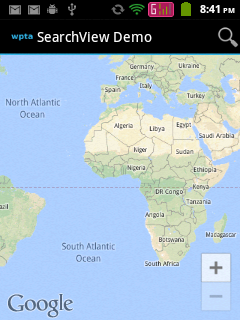 In this application the searchview widget is placed in action bar. 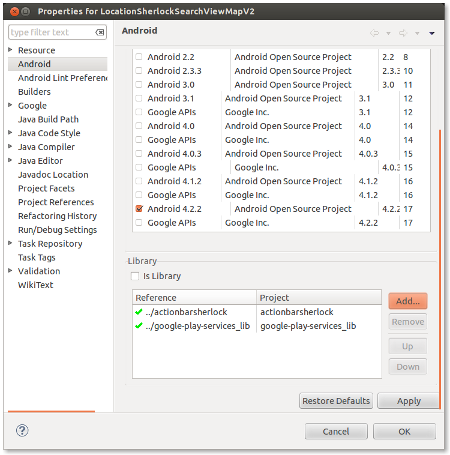 We know that, the SearchView widget is available only since Android API level 11. So will use ActionBarSherlock library for the backward compatibility. MainActivity.java : The search action is placed in the action bar of the MainActivity. An alternative to this application is available in “Adding Google Places Autocomplete API as custom suggestions in Android Search Dialog“, where we have used SearchDialog window for searching places. 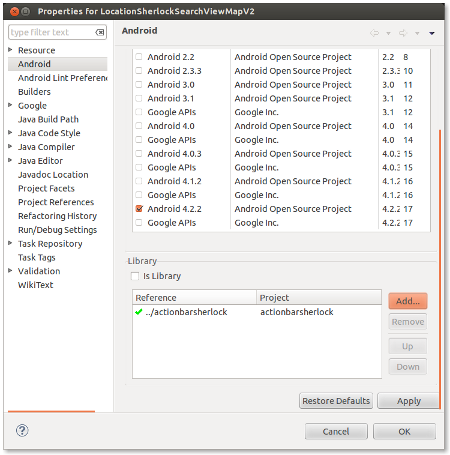 In this application, we are using ActionBarSherlock library for the backward compatibility support of Android versions. 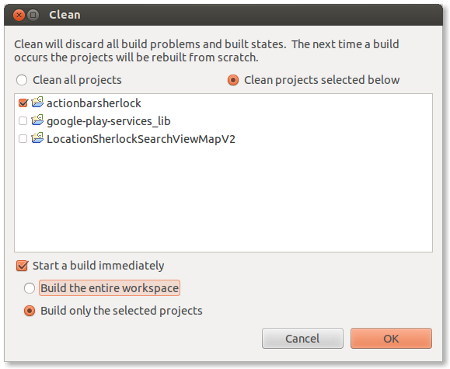 Since ActionBarSherlock library already contains the Android Support library, we have to delete the Android Support Library (android-support-v4.jar) from this project, if it is added automatically by Eclipse IDE. We can delete the library file at libs/android-support-v4.jar . Note : Update “YOUR_BROWSER_KEY on line 39 with the browser key obtained in Step 9. 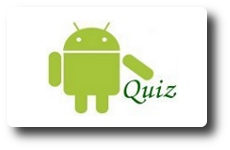 Note : Update “YOUR_ANDROID_API_KEY on line 77 with the browser key obtained in Step 8. It works perfectly, thank you..
may i ask you what is URI authority? Is it same as the package name? URI authority is the identifier of the content provider. This is used in AndroidManifest.xml to declare the content provider. It is just a custom to use the same name as the package name. It works perfectly when I use it as the MainActivity. However, the app crash when I try to intent to this activity from the main activity. I have modified the Manifest. sorry.it seems like the blog doesn’t allow me to paste my manifest config here. What is the difference between this and the previous one? The modified code and your original code look almost the same. The only difference is my modified code using Intent.ACTION_SEARCH.equals(intent.getAction()and Intent.ACTION_VIEW.equals(intent.getAction()as the if-else condition, whereas your original code using intent.getAction().equals(Intent.ACTION_SEARCH)and intent.getAction().equals(Intent.ACTION_VIEW). I have referenced http://developer.android.com/training/search/setup.html and modified my handleIntent() accordingly. I have no idea why your code works well only when the searchable activity is a launcher activity, but it doesn’t work when I try to intent to this activity from another activity. what can I do to correct this error? I’m running in mobile device not in emulator. I have one question. Why do we need to use the content provider? Is it possible to implement the search directly the google places api an displaying the results from search? Do you know how i can realize the search in google maps? I want to save place. Very useful code, nicely done. this code is perfectly running. however there is one problem I am facing. Every time I click on a query that will place marker on map, a new activity is created by LoaderManager, I want to map every query in a single activity. Good afternoon. How can I pause for 1 second delay calling query data from Google Place Api? It is necessary that the user has finished typing a word, without sending a request for each character entered. The problem is that it is necessary to wait until the user has finished typing a word. Generaly I have HUGE problems with the fact that I need to use Sherlock. I have drawer done and I can’t use sherlock library. In that case my SearchView is simply nullpointer. SearchView from appcompatv7 is not compatabile. Any hints how to overcome this obstacle? Anyway it’s very good piece of code, well done. whta is browser key? shall i need to pay for creation of broser key? How can I set searchview at bottom and search from that? pleas help me I can’t understand how to do it?